Nicole's Needlework: Sampler of Stitches Part 8 Finished! I got part eight finished up today after ripping a few specialty stitches more than once. Chain stitches and I just don't get along!! But I finally got them in and left them in no matter what they looked like. Au Ver a Soie Silks, 32 ct. Vintage Bisque linen. I also worked on Paradise Lost a little bit today. I worked on the tree next to the giraffe, but there wasn't enough progress to take a picture. I ended up putting it away to work on Sampler of Stitches again. I'm addicted to this sampler! :) Write soon! I hate chain stitches too! They never look right for me. Your SoS is looking so pretty! That is beautiful!! It is really coming along nicely! Can't wait to see progress on Paradise lost! Your Sampler of Stitches is really coming along. Nice job. It's looking great Nicole. I'm so jealous to watch you work on it because I loved doing mine so much! I can't wait to see more. It is addicting, isn't it? Can't imagine you having trouble with any stitches, Nicole. Your work projects always look **perfect**, and this one is no exception! Great progress!! So pretty! I love seeing how this is coming out! Absolutely gorgeous! 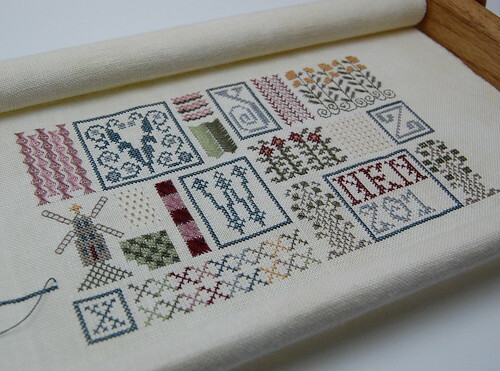 I LOVE that sampler, and it looks like such an enjoyable stitch. Oh Nicole....that is beautiful! Great job as usual. You have gotten so much done already and it is so pretty Nicole! It must really be fun to stitch and you are tempting me! I love your progress and even the chain stitches look wonderful to me! I love Drawn Thread and may try and at least get Block 1 at some point. I am working on Autumn at Hawk Run Hollow and need to post soon. I have been on love with this piece for ages! Yours is turning out so lovely! Query of sorts...I am wondering why the charts for this are so expensive when the stitched area of each seems so small. Is it larger than it looks or are there a lot of directions included for the specialty stitches? Kind of a dumb question, I know, but with ten charts to purchase for the whole thing, I'm just curious. It's so great when you find something that you are 'addicted' to stitching. I find that 'pure joy'! Your blog is my all time favorite of all the cross stitch blogs I read (about 15) Your work is so perfect and beautiful. Sampler of Stitches is a very expensive project. I look forward to all your work on it. Paradise Lost is beautiful too. Oh my, you're cruising along with this - it's awesome! Your work is wonderful, Nicole. This one's progressing so nicely. Such a shame about those chain stitches but I know you would want them 'just right'. Worth the extra effort. Hi Nicole, I love DT designs. Her diagrams for the specialty stitches are aleays fun and easy to follow, don't you think? This is really turning out to be a gorgeous piece. Keep up the stitching! It's looking lovely, Nicole! Great progress!